Giveaway details for Londonderry Dreaming at end of blog post. 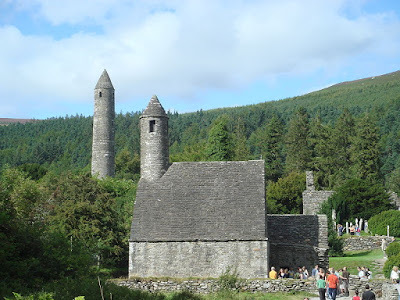 Irish monasteries are often attributed to St. Patrick when in fact the most famous missionary to Ireland had little to do with building grand structures. Patrick was not even the first missionary to Ireland, nor the most educated, though he did endure more hardship than most wandering monks, being exposed to persecution from druids and robber gangs. But thanks to Patrick who went as a missionary to Ireland in 432, and Irish monks, the Celtic church in Ireland was a beacon for Europe during the dark ages after the fall of the Roman Empire. out and returning to their humble retreats for rest and rejuvenation. 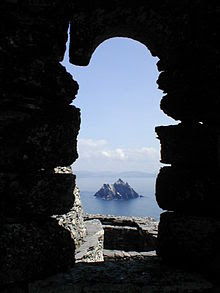 home for 5 to 600 years for ascetic Irish monks. They lived in stone beehive-like structures, worshipped and were a community in 2 boat-shaped oratories within a protective boundary. From the 6th to 8th centuries, the relatively isolated Ireland attracted scholars from Europe. They came to the misty, windswept island to receive the highest level of education in all of western civilization at that time. 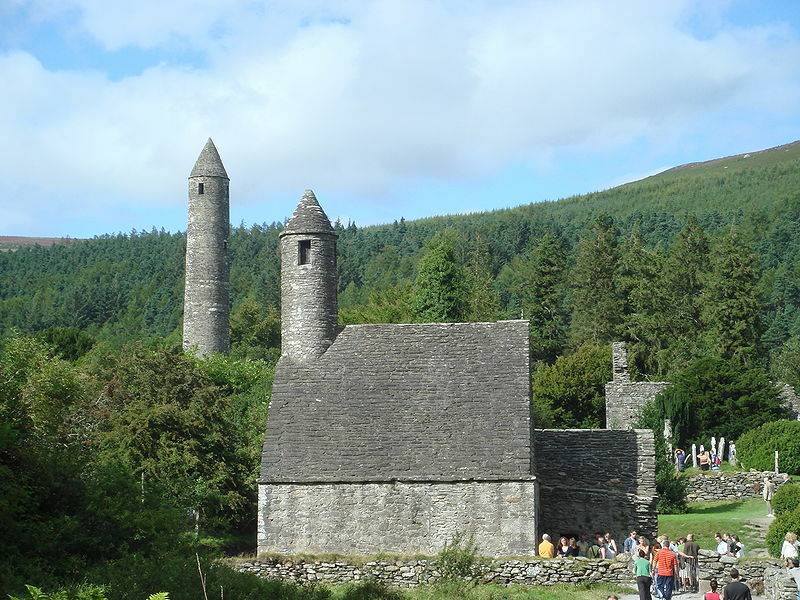 As the centuries passed, Irish monasteries attracted wealthy nobles from Britain and Europe. 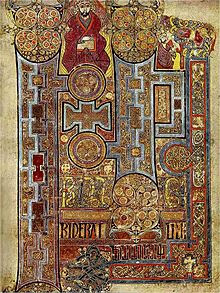 Patronage like this allowed literacy and the arts to flourish, such as illuminated texts like the Book of Kells, and Celtic masonry that can be seen in the lavish detail of stone crosses dotting all over Ireland. 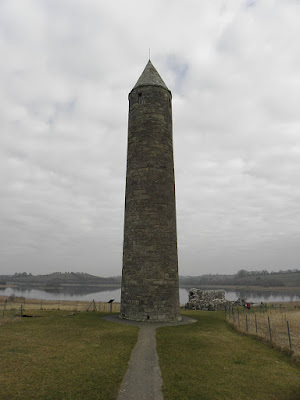 In the 11th and 12th centuries the great monasteries such as Clonmacnoise and Glendalough were established. These communities are more what we think of today in regards to medieval monasteries. well. These later structures were often modeled on Gothic and Roman styles, with flamboyant tracery and fine tomb carvings set in within church graveyard surrounded by low stone walls. tower for a constant watch against raiders. towers, they were the critically needed lookout and refuge against Viking raiders, as well as a place to store valuable illuminated manuscripts. The entrance to stone towers could be 13 feet high off the ground and reached by ladder, which in the event of a raid would be pulled up and inside. Other ladders within the round towers connected the wooden floors within. Sprinkled around the remainder of the community would the abbot’s house, the refectory and kitchen, gatehouse as well as guest houses and stables, and the monks’ dwelling and barns. 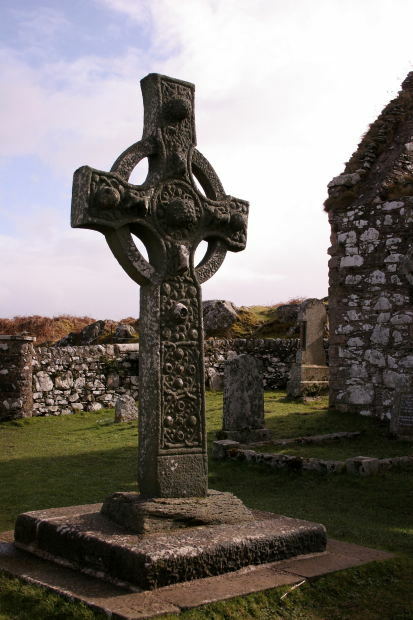 A high Celtic cross marked the monastery boundary. While St. Patrick never built a grand structure his name graces many. 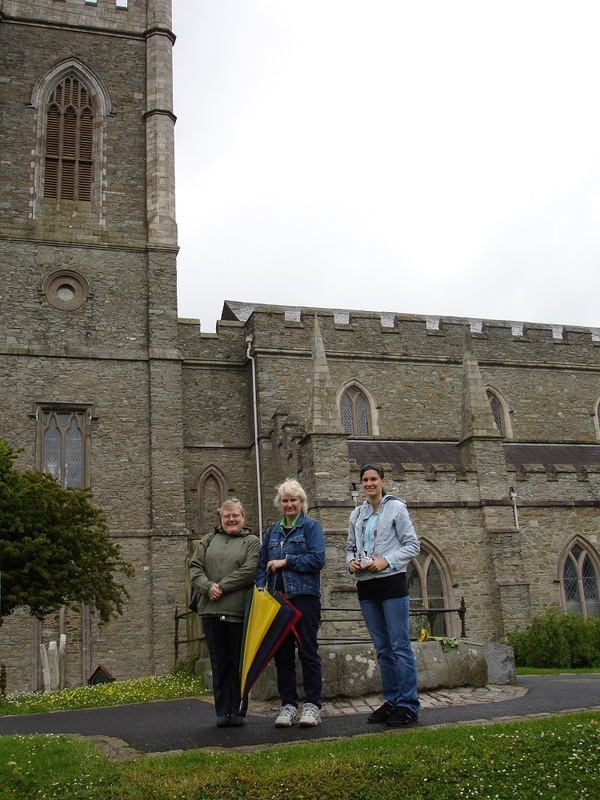 I’ve visited a few, including the church in Downpatrick N. Ireland where the famous missionary to Ireland is buried. Christine’s Irish wit and her use of setting as a character is evident in her contemporary romance Londonderry Dreaming and her newest release Sofi’s Bridge. To win a copy of Christine Lindsay's contemporary romance Ebook Londonderry Dreaming, set on the rugged Antrim coast, leave a comment. Please spell out your email address so I can contact the winner. To enter your name again share this post on social media and leave a comment to let me know. I will draw the winner of the Sunday following this post. To celebrate St. Patrick's Day watch this fun video with toe-tapping Irish music on the book trailer for Londonderry Dreaming. Click HERE to watch trailer. I have always been drawn to all things Irish. I don't know that I have a single drop of Irish blood in me, but I think it's the books I've read that have helped me develop love for the way they've been portrayed. Maeve Binchy was one of my favorites. Thanks for dropping by Connie. Being Irish I can't help but love all things Irish, but I have to admit it is a lovely culture But then I'm drawn to all the differences and varieties of culture around the world. Here's a little Irish blessing for you:May the road rise up to meet you. I love learning new things from history that I didn't know. Hi Heather, I love history too. I guess that's why I read it and write it. :o) If you like history you might want to check out my trilogy Twilight of the British Raj. Chock full of history that might surprise you. Blessings on you too. So interesting, Christine. Oh, and guess what... While working on my Scottish ancestry a couple weeks ago, I discovered that my 2x great-grandfather wasn't a Muir, Moir, or Mair as in my other family surname variants, but was actually James Moore born in Kerrymon, Tyrone, Ireland. LOL, I knew we had to be related Anita. So pleased you found a wee big of Irish in you. Many of my family come from Tyrone as well. A beautiful place. I have often wondered how the monks carried on.....from where did the younger monks come. Perhaps while the monks were evangelizing it had a two fold purpose: tell people about Jesus Christ and recruit more men to join the monasteries. You research has shed light on how they lived. I didn't know they were attacked by the Vikings! Thank you Christine for sharing; much appreciated. So pleased you enjoyed that little bit of history, Debbie. The younger monks would have been recruited like you said, but also the fact that for a long time Ireland was the only safe place for an education during the dark ages. Blessings on you. HI Christine, I had to stop by to see the Irish pics, and also loved your posts on history. 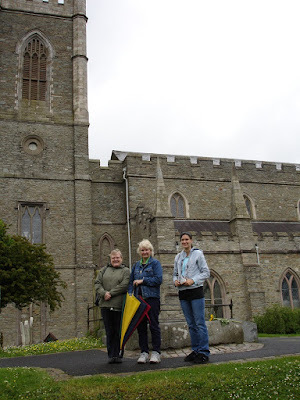 We went to Ireland 3 years ago, but didn't go to any monasteries. We did see some of the beehive huts, though. I hope to set a story there someday! I'd love to win a copy of your book. Not sure if we get extra points, but I shared in 4 places--Twitter, FBook, Google+ and Pinterest. And you are welcome to contact me at rosemccauleywrites(at)gmail(dot) com about doing a guestblog on my blog at rosemccauley(dot)com Let me know! Things in italics to help avoid spamming. 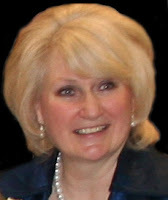 Hi Rose, wow thank you so much for the offer to be a guest on your blog. I'd love that. Will contact you. Hi Christine! I enjoyed your post about Ireland and Irish monks. Such a beautiful place. I would love to visit some day, but for now, I would love to read Londonderry. I LOVED your colonial India series!! Thank you so much Regina. There are some very beautiful places in the world. Very interesting. My great grandmother was from Abbeyfeale, Limerick. We did a choir tour with our church choir around Ireland and it was an incredible experience. Lots of wonderful memories. Can't wait to read your new books! If you have been to Ireland recently then I think you will really enjoy the lighthearted novel Londonderry Dreaming. While it is not a historical novel, it does have some historical elements to the story. The novel should let you feel you are back in the beautiful Irish countryside, and hear the brogue and humor. Thanks for your comment Loraine. And the winner is Connie R. But Connie I don't have your email address. Can you send it to me spelled out here in a comment. Thanks. I'd love to send you an ebook copy of Londonderry Dreaming. Loved the post, Christine! I write historical fiction set in 10th century Ireland, so this subject holds a special place in my heart. We have a bit of Irish in our family, and that led me to search further. It would be wonderful to go to Ireland someday. But it'd be a challenge. My husband thinks if he gets me there, I'll never want to leave. Very probably true. I've been back to Ireland a few times to visit relatives, and I know that if I could afford to live there for a short while I would. One of my dreams is to take an extended holiday there. Oh well, I'll leave that in the Lord's hands. Sadly, I didn't hear back from the first name I drew, so I did a second drawing and the winner is Rose McCauley. I will contact Rose and get a copy of Londonderry Dreaming to her.